After five years as a Chair of Council of Women World Leaders, President of the Republic of Lithuania Dalia Grybauskaitė steps down as a Chair of CWWL and has President of Croatia Kolinda Grabar-Kitarović takes over the chairmanship of the organization. The President took part in a high level meeting on Women in Power at the invitation of María Fernanda Espinosa Garcés, President of the United Nations General Assembly. The event aims to attract attention to major obstacles for women’s participation in politics and business, promote women’s leadership and share experiences on women’s empowerment. President Dalia Grybauskaitė, who chairs the Council of Women World Leaders, attends Women Political Leaders Global Summit “We Can Do It!” in Iceland. The conference that brings together over 300 women parliament members from almost 100 countries, including the Presidents of Estonia, Malta, and Croatia, focusses on ways to end violence against women and empower women to participate in politics and innovative economy. The beginning of the 20th century was defined by brave women who claimed their right to vote. It is up to us to define the beginning of the 21st century as the new era with equal pay, freedom from violence and universal respect for women’s rights. The time is now. After five years as a Chair of Council of Women World Leaders, President of the Republic of Lithuania Dalia Grybauskaitė steps down as a Chair of CWWL and has President of Croatia Kolinda Grabar-Kitarović takes over the chairmanship of the organization. Since D.Grybauskaitė appointment as Chair in 2014, the Council’s unique network has grown significantly, going from 52 current and former women heads of state and government to 74 members. 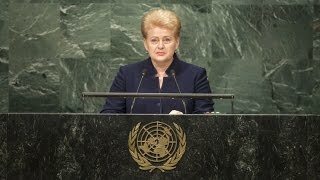 During her tenure, President Grybauskaitė has also continuously strived to increase the Council’s efforts to advance women’s empowerment and gender equality worldwide. She regularly convened and mobilized the highest-level women leaders globally on women‘s social, economic, and political empowerment. At the invitation of the President of the Republic of Lithuania Dalia Grybauskaitė, former Prime Minister of Latvia Laimdota Straujuma and former Prime Minister of Sao Tome and Principe Maria do Carmo Silveira joined Council of Women World Leaders. As Dalia Grybauskaitė enters her tenth year of Presidential reign, Lithuania’s first female President gives advice to the next generation of female leaders.